A new Nato-trained security force has been launched in Kosovo, opposed by Serbia and some Kosovan Serbs. The 2,500-strong Kosovo Security Force (KSF) is meant to include some minority ethnic Serbs, but is expected to be dominated by ethnic Albanians. 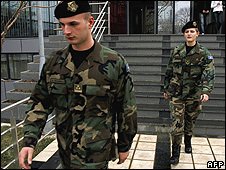 It replaces the Kosovo Protection Corps, which consisted mainly of veterans of the independence struggle against Serbia. Kosovo's February 2008 independence declaration was rejected by Serbia. The KSF will be engaged in tasks such as civil protection and crisis response. It is being overseen by Nato, which has 15,000 peacekeepers in Kosovo and will retain ultimate responsibility for security. "We're at the beginning of a new phase; this force has become a reality," said its commander, General Sylejman Selimi. But Serbian Foreign Minister Vuk Jeremic called the force "an illegal paramilitary group" and "a direct threat to national security, peace and stability in the entire region". Kosovo's independence has been recognised by about 50 nations, including most, but not all, EU states. More than 140 countries have not recognised it. Kosovo's population is 90% Albanian, with a minority of Serbs, who mainly occupy northern Kosovo, bordering Serbia, and some other areas. In December the European Union launched its long-delayed mission to strengthen the rule of law in Kosovo, called Eulex.